Our mobile shredding service allows you to watch as the shredding is being performed! 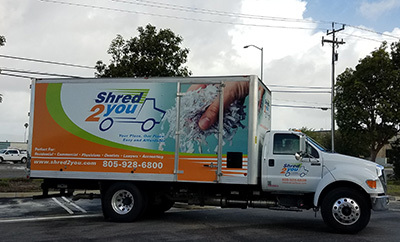 We bring our shred truck, equipped with an industrial strength paper shredder, to your location and a Shred2You Inc. trained and certified professional loads your documents into the shredder while you watch them being quickly disposed of properly. We are happy to provide regular or one-time paper shredding services! to schedule a one-time paper shredding services for your business. We will come to your location anywhere within San Luis Obispo County or Santa Barbara County at a time that is convenient for you, even on evenings and weekends!